On 15 April 1885 Premier Robert Stout, Ngāti Maniapoto leaders Wahanui Huatare and Rewi Maniapoto, and others gathered on the banks of the Pūniu River, 5 km south of Te Awamutu, to launch the construction of the central section of the North Island main trunk railway. 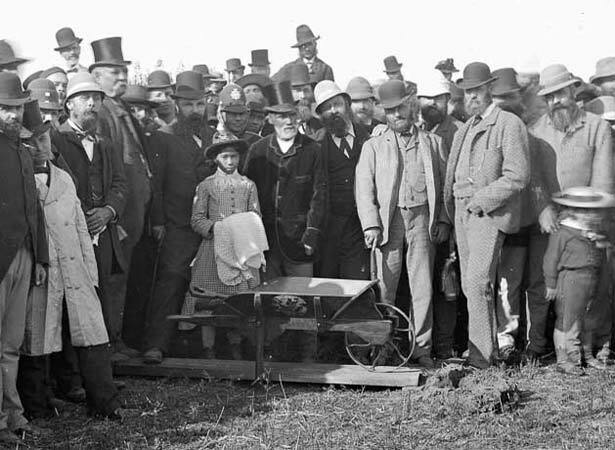 Wahanui shovelled some earth into an ornamental barrow (‘emblazoned with portraits of North American Indians, in default of Maoris’) which was wheeled off and emptied by the premier. A rail link between Auckland and Wellington had been discussed for decades, but progress was hampered by the rugged terrain and the aftermath of the New Zealand Wars. By 1880 Auckland’s southern line reached as far as Te Awamutu, and isolated lines had been built in Taranaki, Manawatū, Hawke’s Bay and Wellington–Wairarapa. Surveys of the central section were undertaken in 1882–3, and in 1884 the government reached a crucial agreement with Ngāti Maniapoto leaders to open up Te Rohe Pōtae (the King Country) to rail development. The main trunk line was finally completed in late 1908, 23 years after the digging of the first sod at Pūniu. We have 4 biographies, 7 articles, related to First sod dug for North Island main trunk .